Hassle-free furniture rental in the Greater Los Angeles area. Upscale la-la land glamour. Hey LA: We know you’ve got the market cornered when it comes to lavish red carpet events and fashion-forward sophistication. So, when it comes to designing a comfortable and luxurious home around your empty apartment or temporary space, why settle for anything less than true perfection? Transform California dreamin’ into reality with AFR® Furniture Rental in Los Angeles. Style drought? When it rains, it pours. AFR offers a diverse selection of beautiful rental furnishings and accessories to complement your lifestyle, ranging from hip and contemporary to classic, minimalist elegance. Our Los Angeles-based team of experienced design and rental consultants is here to guide you step-by-step. 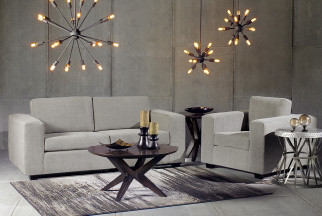 Select online from one of our dozens of professionally curated collections and packages, or choose à la carte from our extensive inventory of stylish and unique furnishings, accent pieces, and décor for any room. Don’t move a muscle. AFR does the heavy lifting. Easy as one, two, three: Delivery, assembly, and installation as fast as 48 hours after placing your order. Flexible Service. Ahead of the trends. Beautiful Housewares, Electronics, Appliances, Accessory, and Furniture Rental Collections for your apartment, dorm, condo, or home! We provide the ultimate in style and selection for Red Carpet Events, Weddings, Corporate Events, Exhibits and Trade Shows and work closely with you throughout the process to ensure your complete satisfaction! Contemporary office furnishings for rent for offices and work areas of all shapes, sizes, and needs! Utilize our beautiful furniture and accessory rentals while working with our design team to save you money by helping your home sell faster! *Qualified leads only. Reward levels vary by lease length. Contact AFR for more details.